Piano Concerto No. 21 in C Major K467 composed by Wolfgang Amadeus Mozart (1756-1791). Edited by Edwin Fischer / Kurt Soldan. For 2 pianos, four-hands. 2-piano score. 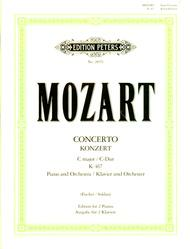 Published by Edition Peters (PE.P2897E).ISBN 9790300756158.2-piano score (one copy provided).